PHILADELPHIA (WPVI) -- If you're planning a trip to the pool or the beach this summer, don't forget your sunscreen and remember to reapply regularly. But if you still end up with a sunburn, Consumer Reports has tips to help you soothe your burning skin and make your recovery more bearable. While there's nothing that can undo the damage, Consumer Reports suggests some steps you can take to make the sunburn look and feel a bit better while it heals. A cool or lukewarm shower can help take some of the heat out of sunburned skin. As soon as you get out of the shower or bath, while skin is still damp, apply some moisturizing lotion, especially if it contains hyaluronic acid, an ingredient that helps bind water to the skin. "Applying the plant's pulp to the sunburned area helps hydrate the skin and calm the inflammation," said Trisha Calvo, Consumer Reports Health Editor. And if the pain is hard to bear, you can take aspirin or ibuprofen. Also, resist the urge to peel your skin or burst any blisters. "Exposing the affected skin increases the risk of an infection. If a blister bursts on its own, you can use a topical antibiotic, like bacitracin," said Calvo. And for the future, don't forget to apply your sunscreen regularly if you plan to stay under the sun for a long time. 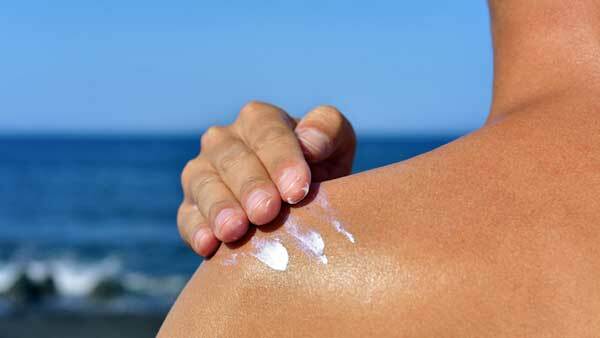 Just one application is not enough to avoid getting sunburned. For a more immediate relief, try a cold compress or even apply a thin layer of cold plain yogurt. If you develop blisters be sure to see your doctor.